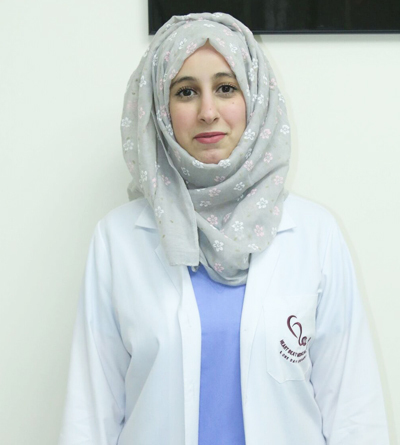 Dr. Dana graduated from Sharjah University, she has experience in all kind of dental treatments especially aesthetic dental treatments. Interested in aesthetic and pediatric dentistry. She has experience in all kind of dental treatments especially aesthetic dental treatments. Extensive experience in diagnosing dental problems and conditions. Proficiency in reading and interpreting dental X-ray result. Expertise in using nitrous oxide with children and adults. Good skills in dealing and treating pediatric patients. Expert in doing composite veneer (facing). Expert in doing both removable and fixed veneer. Proficiency in preparing crowns, bridges and removable dentures. Expertise in teeth whiting using the most percent dental innovations. Expertise in filling teeth cavities and eliminating decay. Proficiency in placing teeth sealants. Dedication to teach patient proper dental hygiene. Expertise in scaling and gingival treatment and eliminate gingival pockets. Good skills in teeth extraction. Expertise in root canal treatment and retreatments.